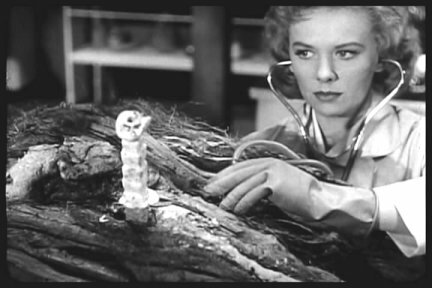 And, as one (perhaps apocryphal) review succinctly put it when this film was first released (1957), “And to Hell it can go!” Considered one of the notoriously bad sf films of the 1950s (though no one seems to notice that it’s not actually a sf film), despite its obvious failings it’s really not that bad and in fact offers up a fair amount of entertainment value in its quick-moving 73 minutes. Right and left, respectively, neither looking very Polynesian. 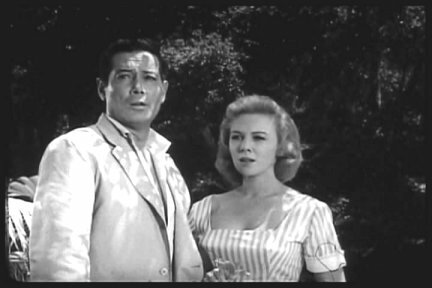 to do away with Kimo (we learn that Maranko wants Kimo’s wife and Tano is just plain pissed about the American doctors whom Kimo befriended). 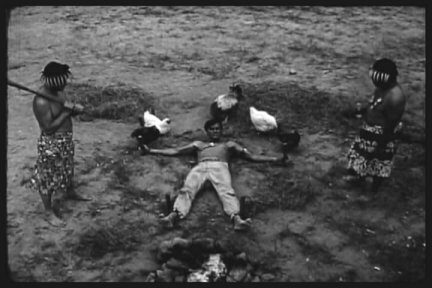 Kimo denounces the two to the on-looking villagers, who execute him anyway, but not before he curses Chief and Witch Doctor, vowing to come back from the dead to destroy them. The chickens seem unimpressed. In the meantime, Dr. William Arnold (Tod Andrews) and Prof. Clark (John McNamara) are discussing the discussing the natives’ health problems in their splendidly appointed hut (with stove and refrigerator). Dr. Arnold doesn’t much care, though. He just wants to hook up with his girl-friend, go back to America and live in the suburbs and start a dermatology practice or something. Fortunately for him, Dr. Terry Mason (Tina Carver) is transferred to the island to help with the natives’ various health problems. Unfortunately for him, she takes a surprising feminist stand. She is not interested in living in the suburbs and having his babies. She wants to do science, damnit, and he’s not going to get in her way with talk of marriage. And there is science to be done. 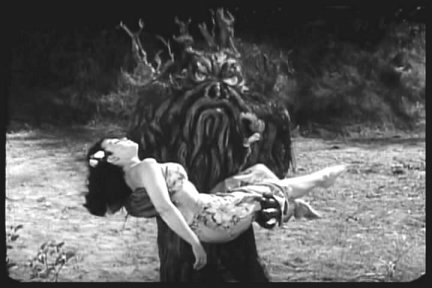 It seems that the natives buried Kimo in a tree trunk, and son of a gun, it starts growing out of the ground. Naturally, the scientists believe the radiation is somehow responsible. But wait a minute. The natives know all about this stuff. Kimo has become a Tabanga, which happens when a warrior is treacherously murdered and he returns from the dead to take his revenge. Apparently this happens all the time. The natives (every slightly swarthy B-actor in Southern California, whether they look Polynesia or, as is most cases, not) sit around discussing various examples of this phenomena, which has occurred frequently in the past, well before atomic radiation had polluted their Eden-like environment. So this film is really curse fulfillment fantasy, not radiation-driven sf at all. Dr. Terry taking the pulse of situation. and, ultimately, let him escape into the world, which he seemingly would have done anyway, without their meddling. And so the story works its way out. 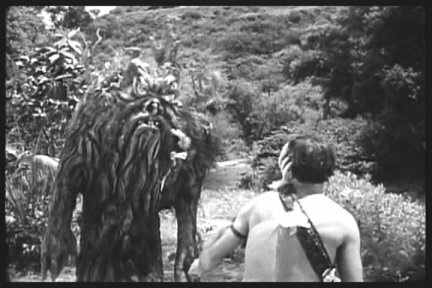 Yes, the Tabanga tree monster (designed by prolific monster maker Paul Blasidell) is rather wooden (there, I said it) but a lot of worse-looking monsters have appeared on the silver screen. He also has Mummy Disease (ie, is unable to walk at anything faster than a stumbling shamble). But he gets the job done. Righteous revenge is at the heart of the story and not random monster brutality or some crazy self- aggrandizing scheme. The acting is largely competent if uninspired, except for the comic relief trading post owner who is exuberant (sometimes excessively so). This gets a mild recommendation from me if you’re a fan of the genre, and a solid 7 rating.